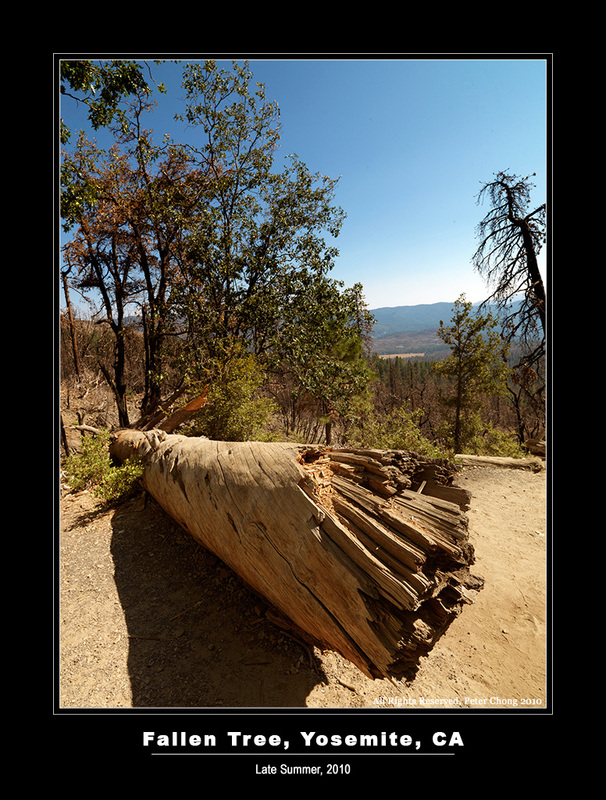 Fallen trees are a fairly common sight in the Yosemite Valley. Something I don't remember seeing much, living in the tropics. 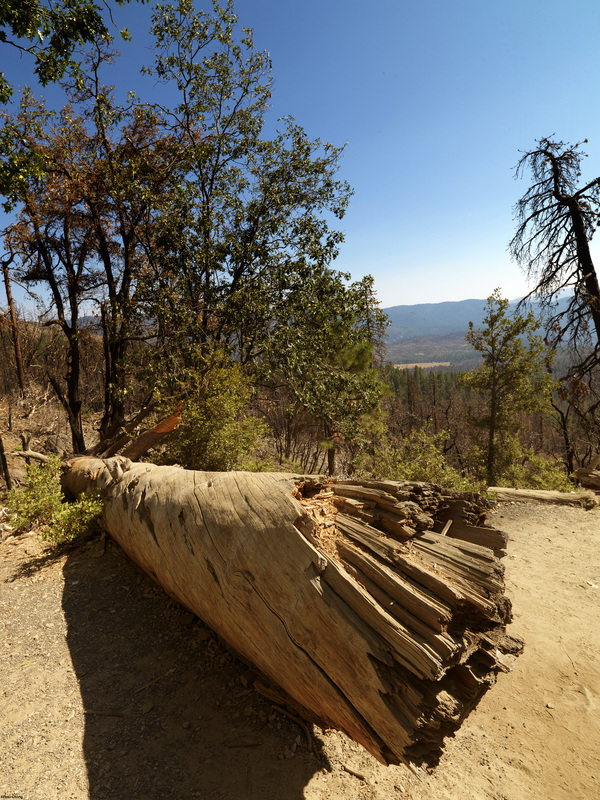 Here are two, in tribute to the landscape of Yosemite. The first, I felt was better conveyed when rendered in black and white. This was photographed on the way to Yosemite Valley, about 2 miles before reaching the gateway entrance as we drove from San Francisco. Metering for black and white is slightly different, and requires a different visualization from colour. I usually only shoot in black and white when I want to emphasize textures...especially differing textures of the subject and its environment. 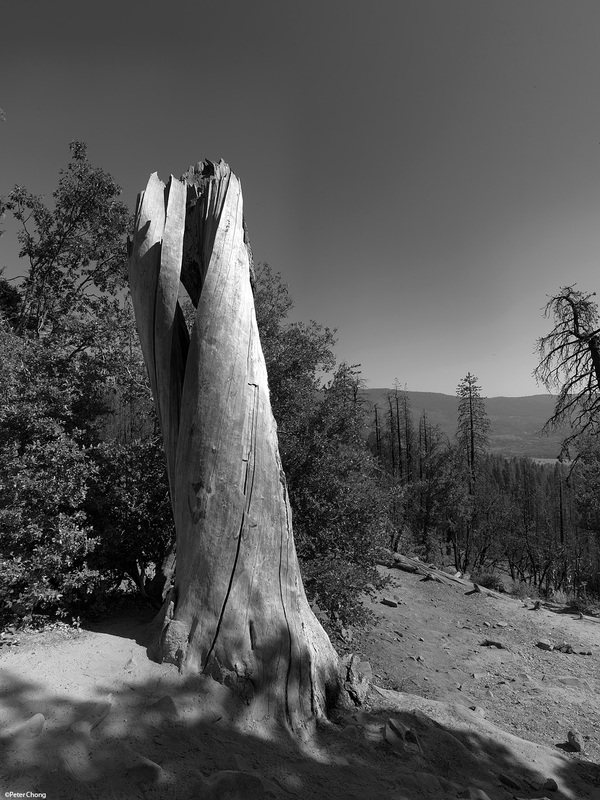 In this photograph, the tree showed a pronounced twisting of its trunk, probably established during its formative years, before it was likely to have been struck by lightning or broke in high winds. The contrast to the bare trunk and the lush surroundings is stark. Even though this photograph is rendered black and white, the leaves just behind the trunk almost leaps out as greenery. And even though I had not used a graduated ND filter, the sky was captured with deepening tones. The next tree looks like the same type. I photograph this not too far from the first trunk. The same twisting is also seen on the trunk. But rendered in colour, the effect is different. Altogether less stark, and emphasizing less on the textural differences but more on the hue and colour tone. I shot this using the hyperfocal method...where placing the lens at its hyperfocal distance will allow everything to be in focus from half that distance to infinity. Note the entire trunk is in focus. As are the nearest point, about a meter from my lens to the mountains in the background.